Like many folks who work at Vulcan today, Doug Mether grew up a farm kid outside of Magnoia, IA. Back then, most of these kids developed their work ethic, mechanical, and electrical aptitude by following their dad around the farm learning skills that would benefit them later in life. There are several of these guys at Vulcan today, but no one other than Doug can claim that their father (Don) and brother (Richard) also worked at that little start-up in Magnolia that would evolve into the company we are today. So how did Doug’s father connect with Vulcan 30+ years ago? He was helping out our founder Whitey Mensching on HIS farm of course! 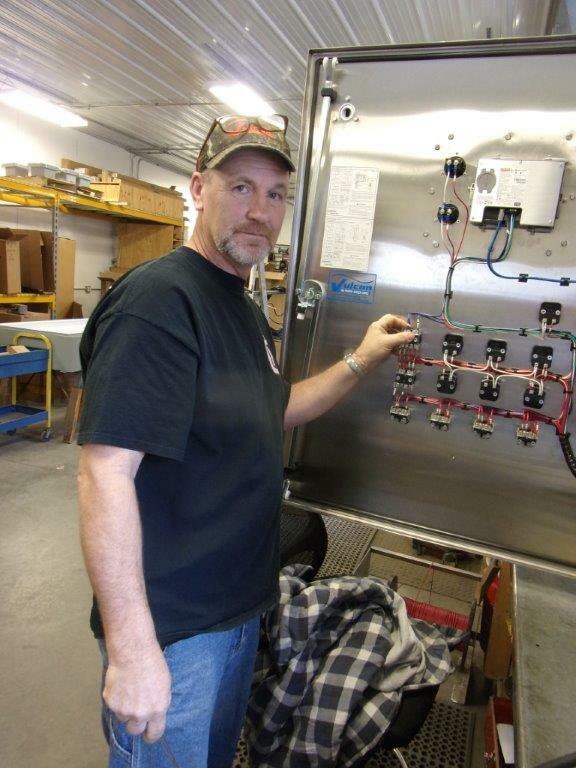 Doug started his career running a lathe machine and recently started building sophisticated control panels and systems that operate a plethora of equipment. Thinking back on his 25 year career, one such project made Doug crack a smile. “We built this challenging control system for a project in Costa Rica only to find out they never operated it. It was always run in hand mode!” Too funny. Because of his well-rounded skill set, you might say that Doug is the most well rounded builder of equipment we have at Vulcan. When he’s not on the job, you can find Doug riding motorcycles and working his cows. Doug and his wife Sarah have been married for 31 years and have 3 kids – one of which is an engineer. Will he work at Vulcan Industries someday and be the 3rd generation Mether to work in Missouri Valley? Who knows? Of course we would welcome his son because it’s guys like Doug, Don, and Richard Mether who form the backbone of Vulcan Industries. Thank you Mether family from everyone at Vulcan Industries and for the thousands of projects your fingerprints are on.